Here at Lehnhoff Supply, we are proud to offer you screened topsoil. Here at Lehnhoff Supply, we are proud to offer you screened topsoil. It is one of our best-selling products, after all. You might be wondering how to use it as you continue working on your landscaping projects in Forest Hill this spring. Well, let’s take a look. Screened topsoil is one of the most common kinds of topsoil. 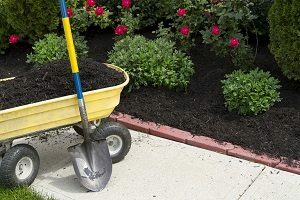 Depending on what you need to the topsoil to accomplish, there are several varieties to consider. Enriched topsoil will have extra nutrients in it, good for replenishing the health of your soil and your Forest Hill yard. If there’s a gap or a spot in your yard that you want to fill in so that it becomes level with the rest of your landscape, then you can use fill topsoil. However, you should also note that topsoil is the uppermost layer of the soil, so anything below that technically shouldn’t be called topsoil anymore. When you till your Forest Hill yard, you can make sure that the roots receive all the nourishment that they need to grow resilient. This way, any gardens you are looking to create will produce higher yields. That said, you should stay away from mixing two different types of soil, since different soils have different water retention capabilities, meaning some of your plants might not get enough hydration while others will get too much. With this in mind, it’s time to prepare your existing soil. Start by getting rid of any weeds you see. Then you’ll want to eliminate any rocks, twigs, or other yard debris that might get in your way. Spread your topsoil and tamp it down, so it reaches through the first 6 inches of soil. The soil beneath it could still be hard, so you might want to dig deeper. You might not be able to do this by hand; in that case, you will need some helpful tools. When it’s time to add new topsoil, make sure the kind you have is the best for your Forest Hill lawn. Luckily, you can depend on Lehnhoff’s Supply to provide you with the best soil you can buy. Once you’re ready to do so, use tools such as tillers and shovels to push your new topsoil deeper into the existing layer of soil you already have. Using some more organic materials won’t hurt, either. If you do use it, however, put it on top and push it down as well. This entry was posted on Thursday, May 3rd, 2018 at 3:27 pm. Both comments and pings are currently closed.